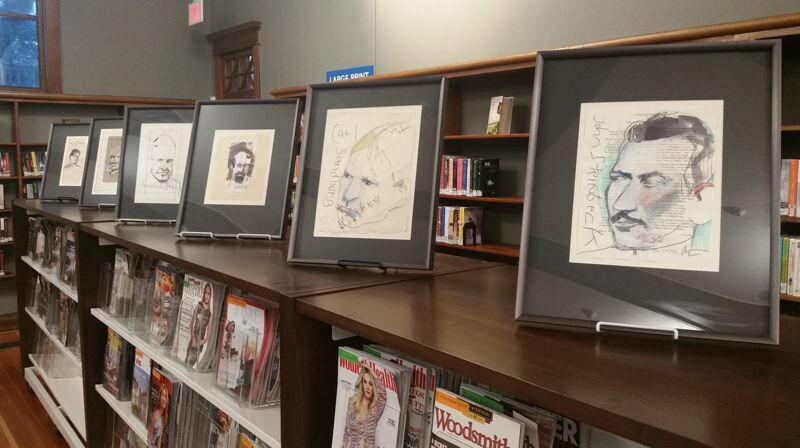 Through the end of the month, Oregon City Public Library is hosting internationally famous artist Rick Bartow's collection of author drawings he titled "From the Heart." Bartow (1946-2016) was considered one of the nation's most prominent contemporary Native American artists. His carving, "The Cedar Mill Pole," was displayed at the White House. Bartow's work can be found at various locations across the nation, including at the Brooklyn Museum in New York; the National Museum of the American Indian in Washington, D.C.; the Hallie Ford Museum of Art in Salem; the Heard Museum in Phoenix, Arizona; and the Portland Art Museum. 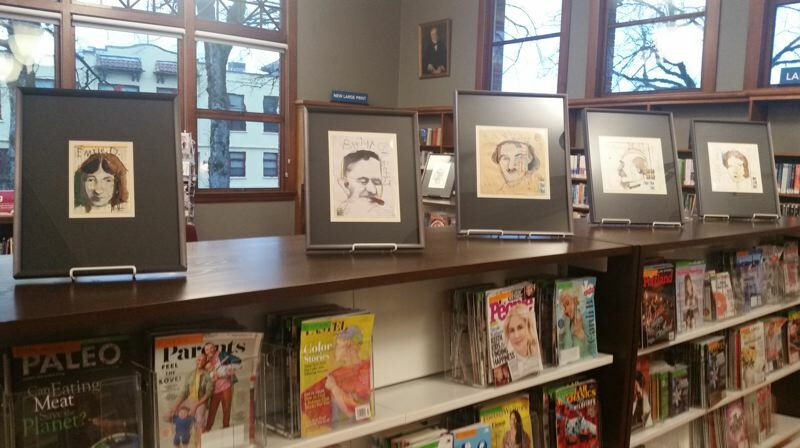 And now, for a short time, Oregon City library patrons can find 17 of Bartow's drawings atop the magazine shelves in the Carnegie Building. His literary portraits feature simple lines and striking color, layered upon a title page, letter or other text item. Bartow used his left hand to write each author's name to create a childlike effect. Oregon City Library Director Maureen Cole thanked the Newport Public Library for loaning the "masterful" drawings to OC, which was the lucky first recipient of the "wonderful collection." "The exhibit fits in beautifully with the goal to display art at the library, which is typically placed in the Carnegie because the shelves are a good height for viewing," Cole said. "Hopefully, the Bartow exhibit, which runs to the end of February, brings people to the library who may not normally visit or think of it as a place for art." Bartow, a Newport native, donated the 17 pieces to his local library in 2000. He used watercolor with pencil and pastel markings on rice paper and repurposed letters and envelopes for the exhibition. "In the abyss following the death of his wife, Julie, Rick expressed his gratitude for authors in the form of the drawings in this exhibit," wrote Karen Murphy, Bartow's longtime friend and trustee of his estate. "With minimal lines and an abbreviated palette of pastels, he portrayed these men and women with loving seriousness. Further, Rick chooses the ephemera of his life and vocation as the background of the portraits. This choice reveals his sly, dry sense of humor — Indian style with multiple meanings." Wyma Rogers, director of the Newport Library at the time of the donation, said Bartow was a regular library volunteer. Bartow told Rogers that the inspiration for the portraits came from a paperback book of famous authors that included their postage stamp-size photographs. "Rick said it was part of what he did to get back into painting," Rogers wrote. "He credited the library with helping him get through his grief." A volunteer from Newport drove the framed drawings — wrapped in crashproof protective cases — to Oregon City, which is the first location outside of the Oregon Coast library to see the drawings. Eight libraries have scheduled hosting the drawings so far, but Newport is hoping for a total of 11 throughout the state displaying the traveling exhibit into the fall of 2020. In early March, Cole plans to drive the drawings for exhibit at the next location, Brownsville Community Library north of Eugene. "It's not a simple thing to send a collection of this size and quality around the state. There are many details to consider and Oregon City Library is kind of the 'guinea pig' for the project," Cole said. The library regularly displays artwork from members of the local Three Rivers Artist Guild. In April, art for the Oregon City library is planned in tandem with Lake Oswego Reads, which is featuring "The Book of Unknown Americans." Cristina Henríquez's novel details a family's journey from Mexico to the United States in the hope of giving their daughter the best opportunities to excel after she suffers a severe head injury. Where: Oregon City Public Library, 606 John Adamas St.